Posted July 25, 2014 by The Rapid & filed under Silver Line. Let’s talk Silver Line. With the Division Corridor Bus Rapid Transit Project arriving in less than a month, we’re prepared to answer any last minute questions you may have. Join us on Tuesday, July 29 and Monday, August 11 in the Community Room at Central Station from 5:30 – 7:00 pm. From new ticket vending machines to designated lanes, Michigan’s first BRT line brings several new transportation aspects to the Greater Grand Rapids area. 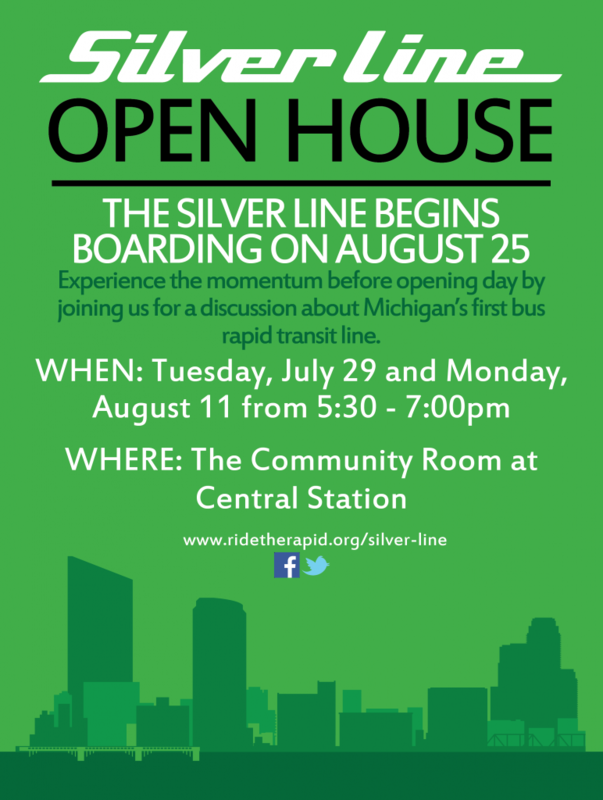 These open houses will feature conversations about elements of the Silver Line with Rapid staff, as well as a chance to see a ticket vending machines and Silver Line bus up close. Experience the momentum before opening day!